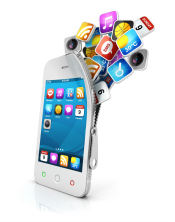 “There’s an app for that!” And if there is not, we can help bring your idea to life. Living in a day and age where the mobile device is as important as our right hand, applications have become a necessary luxury to make our lives easier. Calendar apps to manage your business and personal life, Cloud-based synchronization apps to bring your work with you on the go, as well as Flashlight apps to help you find your way in the dark; there truly is an app for everything. Whether you have the next big idea, or just need an app to streamline an in-house process, we will take your idea from conception to a fully functional application. Would you like to see your next “big idea” with these icons next to it?